German publisher Alba-Collection has launched ‘Bourbon – Rye – Whiskey Distilleries in USA’, said to be the “most detailed subject map of its kind”. “Apart from a few dozens of large distilleries, we also found many hundreds of small craft and micro distilleries, which fall into 10 distinct whiskey categories,” the publisher said in a statement. The map is accompanied by a 24-page booklet, which includes details of all 805 distilleries, and is supplemented by a set of 12 regional whiskey maps drawn up due to the high density of distilleries in some areas. 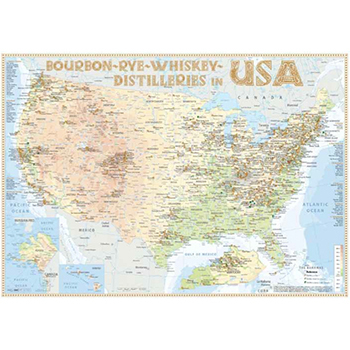 Bourbon – Rye – Whiskey Distilleries in USA joins Alba-Collections other whisk(e)y maps: Canadian Whisky Distilleries and Whisky Distilleries in Japan. Earlier this year, restaurant bookings website 5pm.com released a “definitive” gin map of Scotland ahead of World Gin Day.